The federal government has faced increasingly complex challenges over the past two decades that require greater collaboration across traditional organizational and program boundaries. Congress granted the executive branch the authority to establish and implement cross-agency initiatives, via the Government Performance and Results Act (GPRA) Modernization Act of 2010. That law, among other things, requires the Office of Management and Budget to designate “Cross-Agency Priority Goals” for a small handful of mission-support and mission-related areas, covering a four-year period, along with the designation of a goal leader and the requirement for quarterly progress reports. The federal government reached the end of the first four-year period of cross-agency goals in September 2017. What’s been accomplished? Has the use of this new authority made a difference? Are there ways to improve its use as the Trump administration develops its own set of priority goals? This report assessed the implementation of the 15 Cross-Agency Priority (CAP) Goals (see below) put in place for the period of fiscal years 2014–2017. It is based on case studies, interviews with participants and a review of reports and studies on the implementation of these goals. The report provides concrete evidence of the value of an institutional mechanism that supports working across agency boundaries. 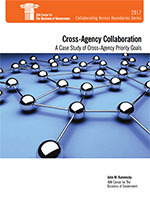 It also provides insights on ways federal leaders can improve this mechanism, both governmentwide and within individual cross-agency teams, in the future.